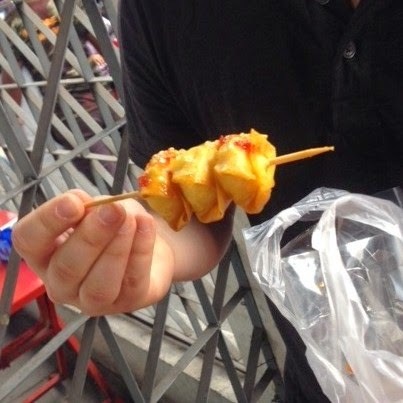 I mentioned in my last honeymoon post that Doug and I were a little bit lost in Thailand without Rick Steves, especially when it came to finding places to eat. However, Doug found our saving grace in Eating Thai Food, a blog that guided us to some very delicious spots in Bangkok and Chiang Mai. Thank you, Mark and Dwight, for making our Thai food dreams come true! Ok, let's get right to it. This little street-side restaurant (which was apparently adjacent to a graveyard) was a recommendation from Eating Thai Food that we never would have found on our own. While all the dishes we had there were delicious (see below for the papaya salad), the Tom Yum soup stole the show. Tom Yum's primary characteristic is its sourness and Doug and I agreed that we had never tasted anything like this Tom Yum before. It was very sour, as it should be, but that sourness was also perfectly balanced with spice. The soup was also chalk full of prawns and my new favorite Thai veggie- straw mushrooms. Eating Thai Food helped us out with this one too. A Northern Thai soup made with coconut curry plus boiled and fried noodles, Khao Soi was on our must-try list and Grandma's did not disappoint. Rich and flavorful with a satisfying little crunch from the fried noodles, this Khao Soi had a comfort-food feel like nothing else we ate in Thailand. It was just so, so good. Yep, another Eating Thai Food rec. Khao Kha Moo is pork leg served with rice and this particular stall is very popular in Chiang Mai if not just for the delicious food, but also for its purveyor's famous cowboy hat. The Khao Kha Moo was so good that the Americans next to us ordered a plate each... and then a second round. We might have done the same if we weren't saving room for some Suki at Suki Koka next door. When we first bought a bag of these little guys, we had no idea what to expect. Would they be savory or sweet? What was that white stuff?? 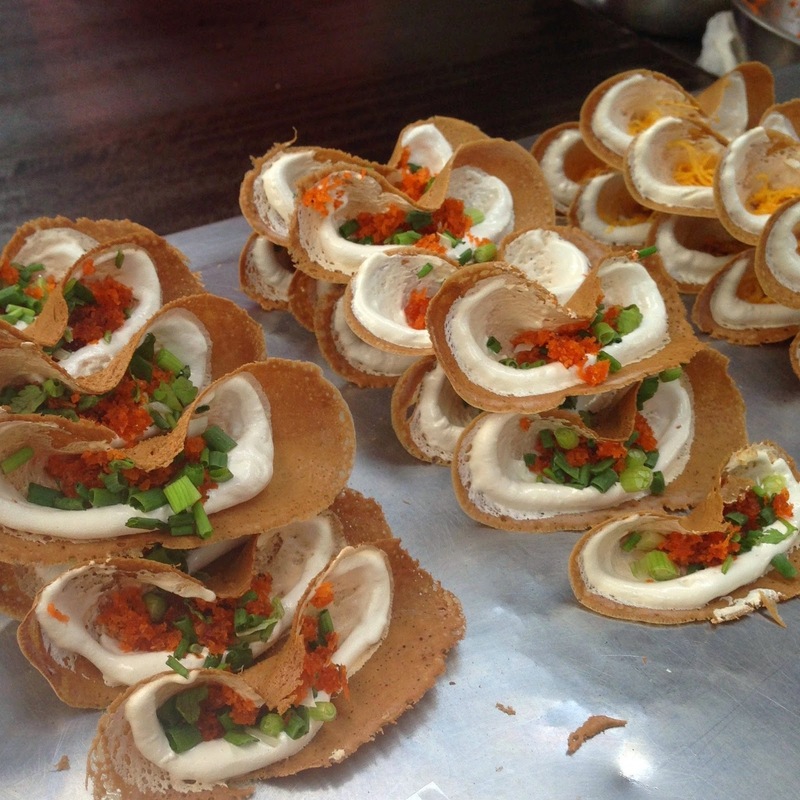 Turns out they were Kanom Beuang- crispy Thai pancakes topped with coconut cream and one of two different toppings. Thai Food and Travel says "the stringy bright yellow filling is extruded duck egg yolks cooked in syrup and the deep orange filling is a mixture of shredded coconut cooked with minced shrimp or ground dried shrimp." Definitely didn't know that's what we were eating when we tried them... but regardless, these little taco-like treats became a favorite of mine during our time in Bangkok. In college, Doug and I would go on Tuesday Friend Dates and one of our most memorable meals was a very unsuccessful trip to Pok Pok back when it first opened. Our server recommended that we order the papaya salad... but for some reason neglected to explain that it was very, very spicy and should be eaten with rice. Not a good first introduction to papaya salad but I think the dish has fully redeemed itself in our eyes thanks to this version. This salad was a balance of spicy with sweet- which made it much more enjoyable. We also liked that they didn't skimp on the peanuts. 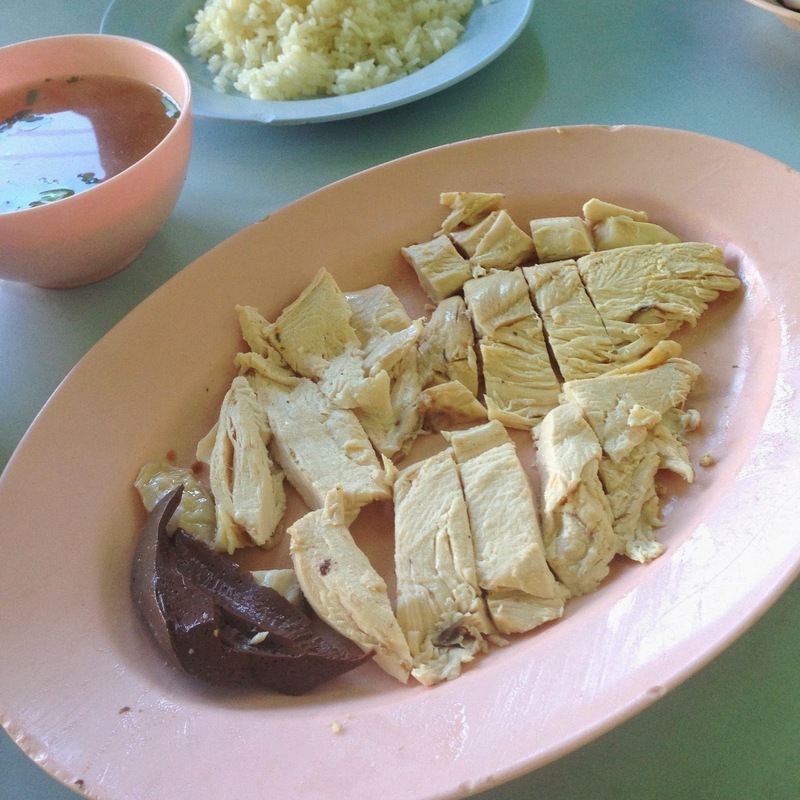 Khao Man Gai at Kiat Ocha in Chiang Mai. 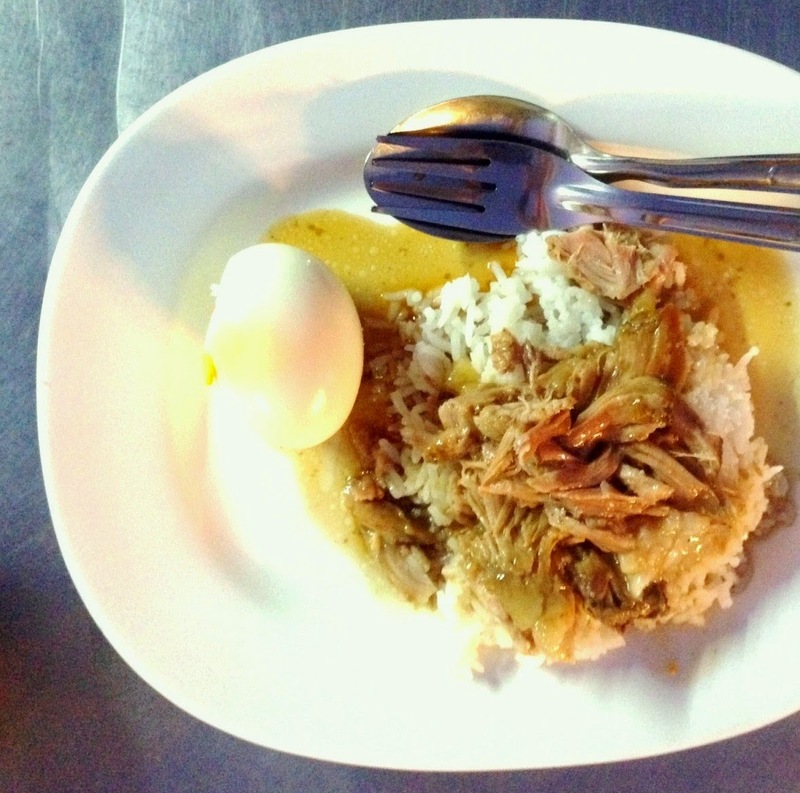 We are big fan's of Nong's Khao Man Gai here in Portland so we wanted to make sure we tried some chicken and rice in Thailand too. Like Nong's, the best thing about this dish was definitely the sauces. We also got an order of Moo Satay on the side and that was delicious too. The little beach-front restaurant where we had this calamari (along with some tasty Khao Soi) was super cute and the owner/cook was so, so sweet and unassuming. 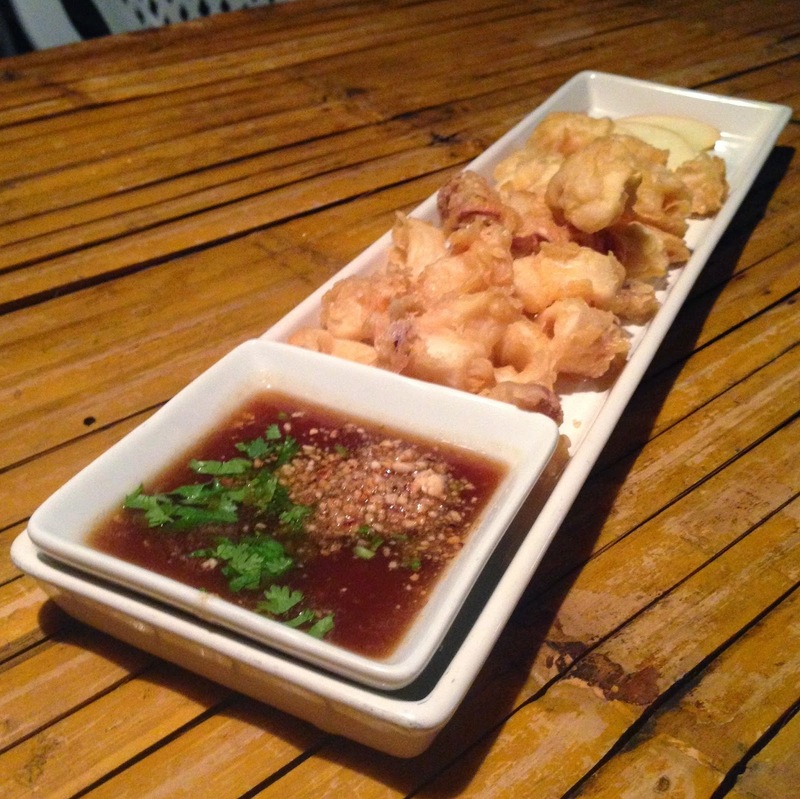 The calamari was very fresh and we loved how the tang of the tamarind sauce complimented the lightly-breaded calamari. 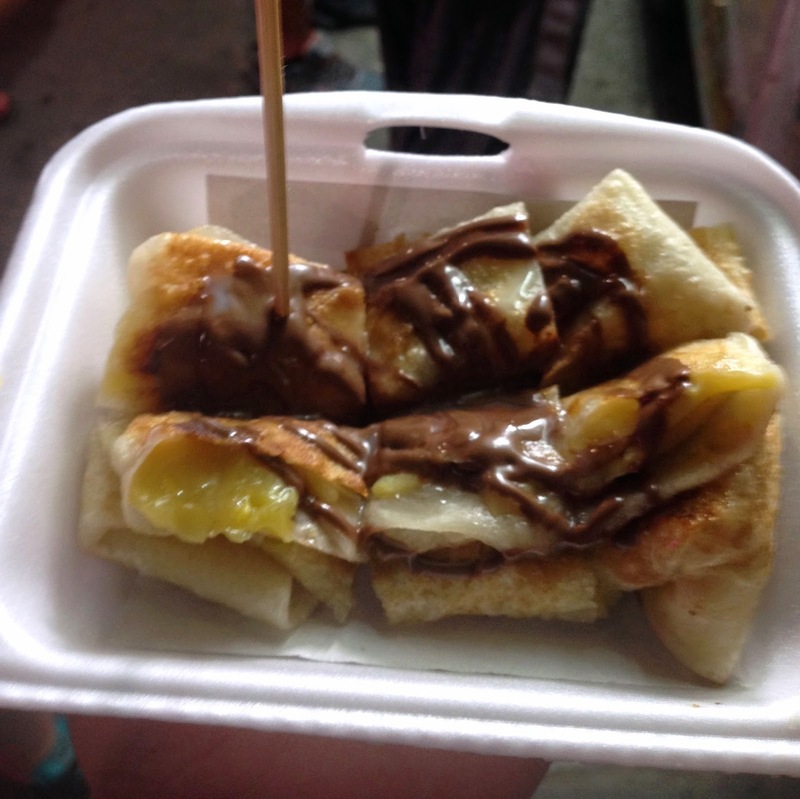 Rotee (or Roti) is a fried crepe-like flatbread that is filled with savory or sweet ingredients. We always got ours with bananas and Nutella (because Nutella, obvs) but bananas and egg was also a popular combination. These might not have been the most delicious things we ate, but they're still worth noting. Fried Quail Egg Wontons from a street stall in Bangkok. Like the Kanom Beuang, we had no idea what we would be getting when we bit into these little skewered wantons- which was part of the fun! Turned out those wantons were filled with quail eggs. Surprising but also tasty. 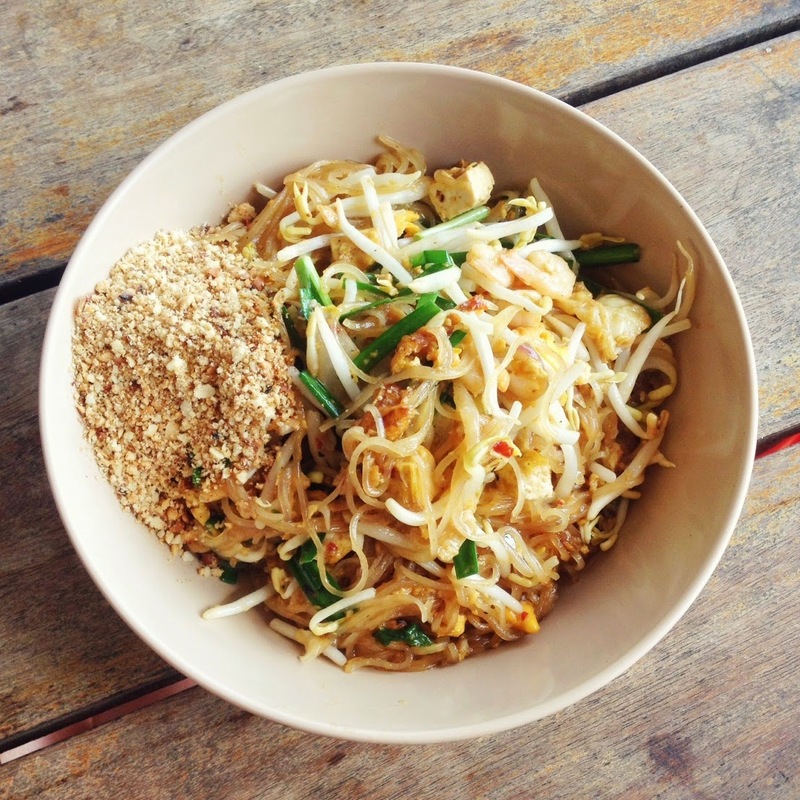 Isn't this the prettiest bowl of Pad Thai? Doug says it was also the most delicious Pad Thai he had in Thailand. I don't agree with him but I was also 1) grumpy from a long walk up-hill and 2) totally over fried noodles at that point in the trip. Did you know that Thailand is 7-Eleven's third largest market after the US and Japan? 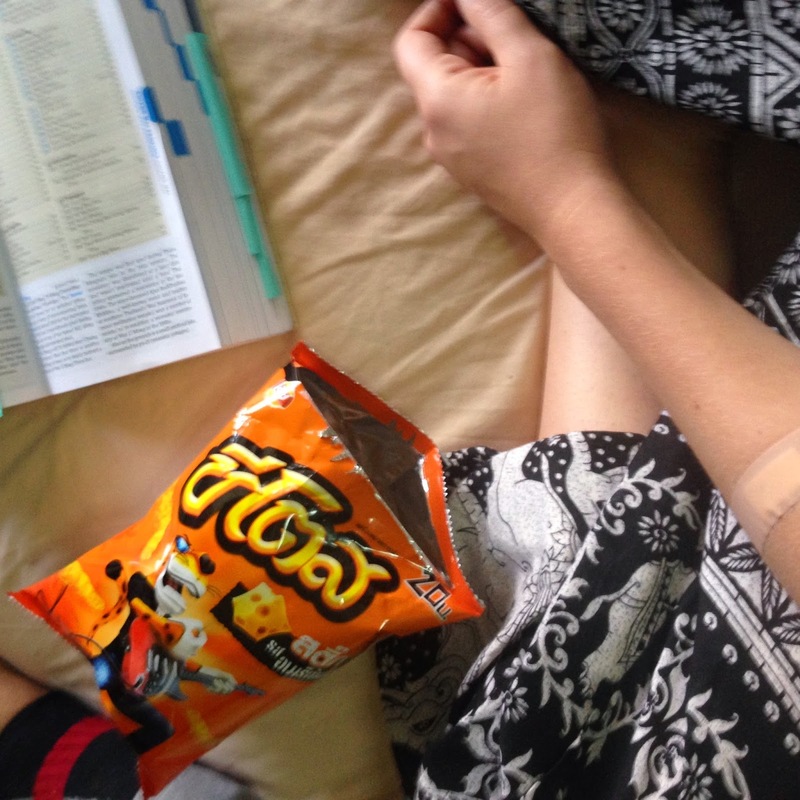 I did because there was a 7-Eleven on almost every corner in Bangkok and Chiang Mai. Doug and I did our best to eat Thai food for most of our meals, but sometimes you just need something quick and easy to take back to the hotel to snack on... and that's were chips came in. I tended to played it safe with Thai Cheetos but Doug took advantage of Lays diverse flavors including Nori Seaweed, Lobster, and Scallop. Coming up: Our favorite places to drink in Bangkok! Honeys Heart: Macarons and a surprise box of goodies! A few weeks back Katie and I had macaron overload (don't get me wrong, not a bad thing!) and attended Farina Bakery's opening one night and Nuvrei's new Mac Bar opening the next. Yes, we were lucky (and Katie was pretty much in heaven) with back-to-back nights of delicious macarons. Nuvrei was celebrating the opening of their Mac Bar (more about that in a bit) but took the opportunity to also feature their other patisserie offerings. Upon arrival we were handed "passports" to get stamped at each station which included bagel sandwiches, croissants, a baked good, and of course macarons. We started upstairs with the Pretzel Bagel Sandwiches. Nuvrei offers 6 different kinds of bagel sandwiches in their cafe including salmon, avocado turkey, and fried egg. It's probably a good thing that neither of us work in the Pearl because these would be the most perfect quick lunch. Next up on our checklist were croissants and baked goods. 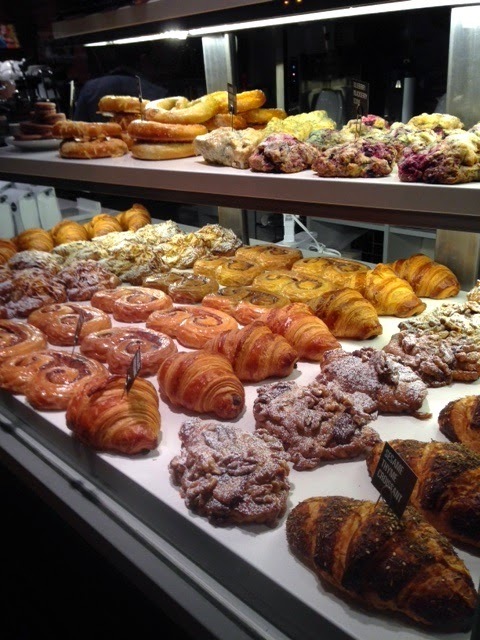 As you can see, Nuvrei offers a ton of different croissants including chocolate croissants (so, so good), sesame thyme croissants, and walnut croissants. They also offer sandwiches with croissants, which I'm sure must be super tasty too. We also tried the Double Chocolate Brownie Cookie, which was essentially brownie batter in cookie form.Yum. Last up was a trip downstairs to the Mac Bar for Nuvrei's famous macarons. This new counter space will feature macarons, freshly-baked croissants, and drip coffee from 9am-5pm Wednesday-Sunday with fresh croissants baked until 2pm. The space is very small, so it's essentially just a cute, easy spot to duck into for a quick treat and coffee before heading back out into the Pearl. 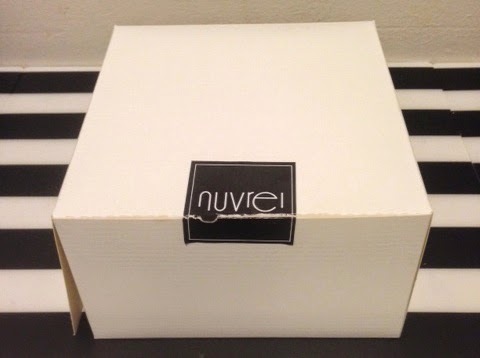 Before taking off for the night, we could either select a pastry from Nuvrei's display case upstairs or get a surprise box. Of course curiosity got the better of us and we both went with a surprise box which included a couple croissants, a macaron, and Bacon Cheddar Biscuit. 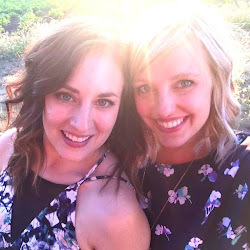 Katie and I have been to quite a few blogger events in the past couple of years but I have to say, this one was one of the more creative and fun events we've been to in a long time. The passport was super cute, gave everyone something to do instead of just hanging around, and was a great conversation starter too. 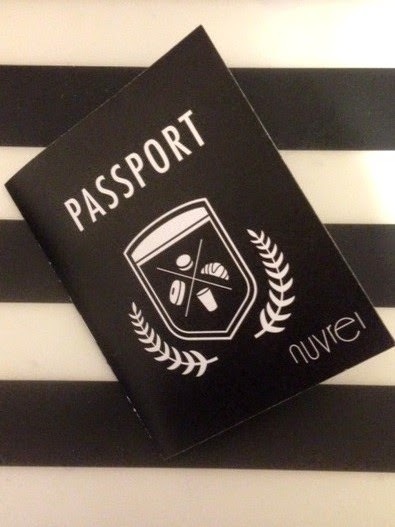 Well done, Nuvrei! We'll definitely be back. It's that time of year again. 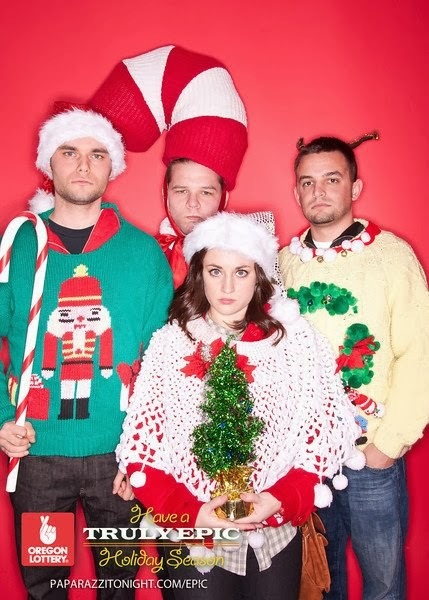 The Christmas trees, office parties, homemade cookies, and... THE HOLIDAY ALE FEST! Nothing gets me in a more cheerful spirit than drinking some barrel-aged imperial stouts, peppermint-infused porters, or cranberry saisons under a giant tree with friends, family, and a few thousand festive strangers. The story is that Deschutes lost some barrels of Mirror Mirror in their warehouse, only to rediscover them some years later. I'm not normally a barleywine fan but I went back to this one twice throughout the night. All the harsh, strong flavors have faded with time leaving just subtle hints of pinot noir and a sweet and sour finish that will linger long after your last sip. Gargantua (2013) - Imperial Strong Ale Blend from Eel River Brewing Co.
Ok this is cheating because its the same wonderful beer as last year. But I don't care because its SO GOOD! Last year, some of us felt the vanilla was slightly overpowering but with a year of aging, the sweet flavors have mellowed some and the profile is a bit more balanced. This is still a beer that only works at the holiday ale fest because it's like drinking a delicious dessert. But what a delicious desert it is! (PS. Make sure to check out this year's version of the Gargantua as well for comparison's sake). Smells like gingerbread cookies, tastes like Christmas. Our group was divided on this beer but if you like sours, this was a special beer. Cascade always manages to challenge your tastebuds with new and unique beer flavors and with Gingersnaps, they don't disappoint. It's a strong red sour with lingering booziness and holiday spices. One of the challenges of being a brewer at the Holiday Ale Fest has got to be how to make a unique beer without being over the top. Oakshire finds that sweet spot with their blonde stout. It's different (it looks like a pale but tastes dark with coffee and chocolate hints) but it doesn't assault your senses with overpowering flavors. With big beers, it's all about balance. With their barrel-aged Abominable, Hopworks mixes vanilla and bourbon spice with slight hints of citrus and caramel creating a really tasty treat.